PHP Training is essential for MCA, BCA, B.Tech (CS/IT) students as it is the requirement of our modern IT sector. 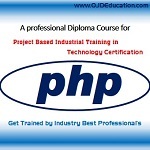 If you are MCA or B.Tech fresher and want Job, you can go for PHP training at OJD Institute. There are many institutes and coaching centers in Lucknow, who claim to be best in PHP Training. OJD Institute offers hands on training in PHP technology in Lucknow & Kanpur.